JDUy: TechWhet: Facebook: Difference between LIKE and FOLLOW buttons. Facebook: Difference between LIKE and FOLLOW buttons. So, you want to use Facebook's Social Plugins on your website. So, there's two Like buttons and a Follow button. What's the difference? The Follow button is intended for use by individual members of Facebook who want to allow other people to track their "public" posts, without having to become a "Friend." 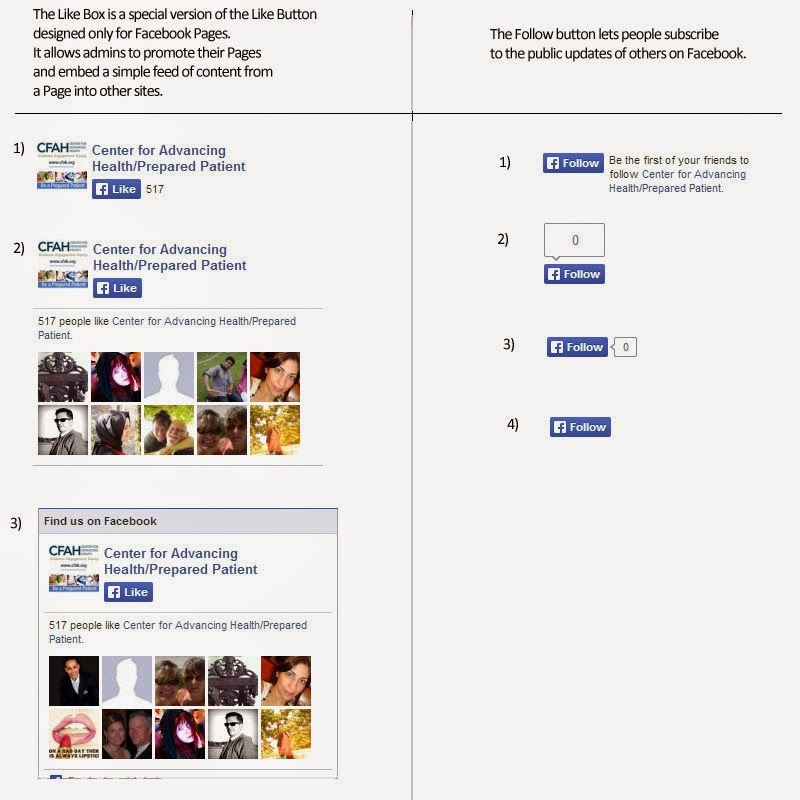 The Like Box is for special "Pages" on Facebook that have been set up by organizations, companies or famous people. People who Like a Facebook "Page" will see posts from that Page in their own feed. Now, totally separate from those two is the Like button, which is meant to be placed on specific web pages that are not part of Facebook. When someone goes to a web page, and enjoys the content on that page, they may see a Like button placed there by that site's webmaster. The reader can click on the Like button which creates a connection between that URL and their personal Facebook feed. A status update will show that the reader Liked something, and his/her friends may also see that on their personal feeds as a status update for the reader. So, again, if you have a special "Page" on Facebook, you probably want to use the Like Box to promote your presence on Facebook. When a visitor clicks Like in the Like Box, the post you put on Facebook become part of the visitor's Facebook feed. Likes for an organization's Facebook page are not the same as Likes for a specific URL at an organization's website. The separate Like Button is used to specify interest in a specific URL. That interest is also conveyed as part of the visitor's Facebook feed. However, the Like Button will also show friends of the visitor that they Liked that specific URL. It's confusing because it uses all the same English terms, but the results are different. Really, your organization would want to use both the Like Box and Like Buttons to increase your social presence. Thanks for this post... I was trying to figure out why my "page" wasn't showing any "followers" but in this scenario, likes DO NOT = followers.